Today it’s been exactly 5 years since our favourite fiddler won Melodi Grand Prix, the Norwegian selection for ESC. We celebrate the day with a look back on the night it happened. Tonight our favourite Fiddler celebrates with a spectacular concert that is concluding a seminar in New York together with the children of the Trinity School. Alexander Rybak is a guest artist at the Vestlandsfestivalen. This weekend he will meet Nesttun Young Strings again who he performed with in October 2012. Today, 7th February, exactly 5 years ago, the first public performance of Fairytale was shown on Norwegian TV. The occasion was the semi-final of the Norwegian ESC selection, Melodi Grand Prix. We celebrate the 5 years with 7 different performances of Fairytale from around the world. They are not selected because they are the best, but because they are in different settings. Since the Olympic Games in Sochi starts today, we wish everybody good luck with the games. February 7th 2009, at the Melodi Grand Prix semifinal in Skien, Norway. Alexander captured many hearts this night. Article about the Christmas concert in Tønsberg, Norway, 18.12.2013. Article was published in paper issue of “Tønsberg Blad” 19.12.2013. It was the violin virtuoso Alexander Rybak who got the biggest hold on the audience`s heart during the Christmas concert at Tønsberg cathedral last night. The applause was never ending after his Norwegian/Belorussian Version of “ Vi Tenner Våre Lykter”. The 27 year old winner of the Eurovision Song Contest will soon top our national hero Arve Tellefsen. Alexander had a 3-day seminar with children’s marching bands from Ski, Drøbak/Frogn and Nordby, which finished with a smashing concert on November 3rd in Rådhusteater, Ski (Norway). Concert with the youth-orchestras in Ski, Norway, 03.11.2013. Got to join the band: Alexander Rybak called his performance at Rådhusteatret on Sunday his audition to “join the band”, in other words the marching bands from Nordby, Ski and Drøbak/Frogn. He passed it with flying colours. Alexander Rybak bestowed glory to the marching band society in Follo. Well done from Nordby, Ski and Drøbak/Frogn. The celebrity concert has been a tradition for a long time and the 2013 edition will go down in history as one of the very best. The members of the school marching bands from Nordby, Ski and Drøbak/Frogn can pat themselves on the back after a well-executed event at Rådhusteatret during the weekend. They entertained a sold out venue for two hours with marching band music at the highest level. The celebrity concert 2013 is the result of persistent work by the marching bands. Alexander Rybak in concert with Prima Music School in Ytteren, Norway, 27.10.2013. A full packed Ytteren Church was served an amazing concert with Alexander Rybak and Prima Music School. Alexander Rybak and Prima Music School gave the audience “value for the money”. The seminars on Friday and Saturday were all topped off with a concert in a packed Ytteren church Sunday night . It was so fully packed that some had to stand or sit on the floor. The concert was well set up with a mix of solo performances by Rybak, performances by Prima Music School only and performances by the music school and Rybak together. Alexander and dance band “Time to show” performed at the open-air festival in Maridalen (Oslo area). A bunch of international fans attended this festival and met Alexander. Here are nice pictures from the venue provided by Camelia Valentina (Romania) and Blanka Michałek (Poland). Alexander performed at the outdoor concert in the courtyard of the Vigeland Museum in Oslo on August 18th together with pianist Stefan Zlatanos and a young violinist Inga Våga Gaustad as a guest-artist. Here is a full playlist of videos, made by the facebookies who attended this concert. Videos are listed in the order the pieces were performed. Photos: Alexander Rybak at Valdres festival 27.06.2013. The article was published in paper issue of “Valdres”, 27.06.2013. Found by Ulli Cologne. Translation by Jorunn Ekre. Alexander Rybak is instructor and inspiration to over 40 young strings at Valdres Summer symphony. Ingrid Fuchen Røyne thinks it`s a fairytale to have Alexander Rybak as an instructor during Valdres Summer symphony. The 13 year old from Fagernes, who is the only person from Valdres in Rybak`s class isn`t the only one who thinks this. Together with over 40 other young strings, she pays attention and with a firm grip on violin and bow and listens for most of them to the well-known violinist and artist while he is instructing. Alexander Rybak and “Elg” Elgenes in Dagbladet 22.6.2013. Meet: The artists Øivind ‘Elg”‘ Elgenes and Alexander Rybak will participate in this autumn’s “Hver gang vi møtes” on TV 2. Both musicians were happy to be asked, and had to clear the calendars before the recording this summer. Alexander Rybak (27) believes he has become better at dealing with all the attention. While Øivind “Elg” Elgenes deliberately stayed away from parts of the spotlight. Article about Alexander Rybak’s performance at Morodalsfestival, 15.06.2013. The article was published in the newspaper “Glåmdalen”, 16.06.2013. Found by Ellen NL. Translation by Tessa Lande. NORD ODAL: Martin Johansen will not wash his belly for a long time. Because his new hero has written his autograph there. – It was very nice to talk to Alexander Rybak , but I don’t remember what he said, the guy from Sarpsborg says, who was one of nearly 100 mentally challenged who flocked to the fiddle playing artist after the concert at Sand in Nord-Odal Saturday afternoon. Alexander Rybak took his time with autographs, and he was one of the main reasons for the high show factor of the 5th Morodalsfestivalen. – For four years we have tried to get Alexander Rybak here, and for four years it has rained during our festival. Now Rybak came, and the sun came with him, a satisfied Olav Hagen said, who guided a crowd of more than 1,000 people through the weekend’s festival below Milepelen Inn. Alexander Rybak is shortlisted for the Social Star Award! Link to the source. Found by Ulli C.
Overview prepared by Hilde M.
Today he was shortlisted for Norway Social Star Awards by Starcount. Starcount is a company that count and chart the performances of public profiles on social networks. The Social Star Awards will be held online on Youtube 23 May, 2013. Alexander is Nr. 4 on the today’s Chart for Norway, just pushed down one place by A-ha due to their short revival at the Bilboard show. He is Nr. 17 on the All-time Folk Chart, worldwide. On the total Global Chart, he has increased his ranking from about Nr. 11 000 in December 2012 up to Nr. 5789 today. With a total of 59,537 Twitter followers, 577,899 Facebook fans and 37,957,370 YouTube views. Today Alexander Rybak gained 222 Twitter followers, gained 434 Facebook fans and gained 59,723 YouTube views. Bettan keeps the artist buddies in line. Fruit plate: Alexander serves Bettan and Didrik a healthy breakfast at Hotel Klubben in Tønsberg. Jokes about single life: Elisabeth Andreassen demands that Alexander Rybak (left) and Didrik Solli-Tangen stay single until after the trio`s summer shows are over. Found by Tessa Lande. Translated by Jorunn Ekre. English revision by Anni Jowett & Katie Anderson. The handsome guys Alexander and Didrik are both bachelors. Elisabeth Andreassen thinks this is good for their summer shows. Video: Alexander, Didrik and Bettan talk about their summer show in Tønsberg 08.04.2013. Recording by Ulli Cologne. English translation by Tessa Lande. 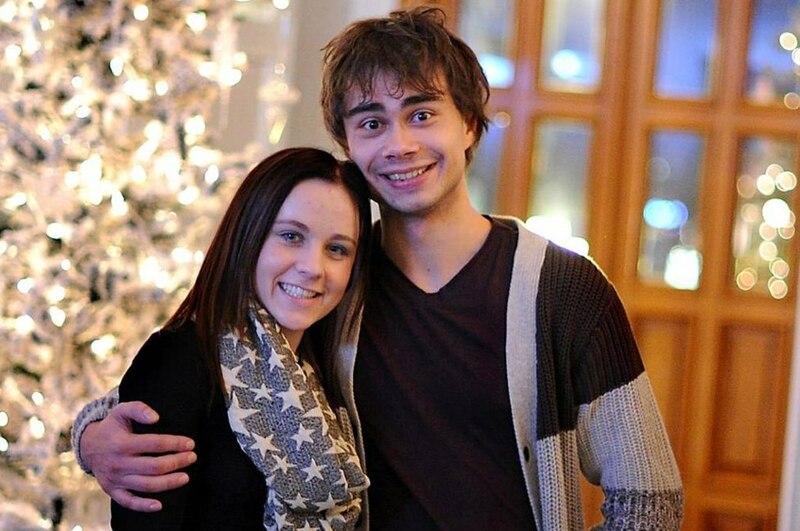 Interview with Alexander Rybak & Annsofi 09.02.2013. Tonight Norway will pick who their entrant will be for Eurovision 2013. One of their hopefuls is Annsofi, who will perform a song written by none other than Alexander Rybak. escXtra.com was lucky enough to catch up with both of them. Recorded by May Elisabeth. English translation by Laila S.H. English revision by Lillian Llewelyn. Subs by Zhanna Sergueeva. Found by Tessa Lande. English translation by Hilde M. Revision by Lillian Llewellyn. Annsofi: Annsofi participated with “I’m with you” at the MGP semifinal in Floro Saturday. Photo from rehearsal before sending. – Thank you all who have voted. My dream is to go all the way to Malmø, says the girl from Sarpsborg (18) who was the first to be ready for the final in Floro Saturday night. Her role models are Tina Turner and Janis Joplin. She has heavy backing from Fredrikstad people: Kenneth Gutterup, JP Paulsen and Einar Kristiansen is her local producer team. Manager Dag B. Solheim needs no further presentation in fb.no. On October 29th Chat Noir in Oslo celebrated its 100-year anniversary with a concert, where Alexander and many other artists participated. The concert was recorded by the national TV-channel NRK and was aired on November 17th. Alexander made a duet performance along with Didrik Solli-Tangen.